The declining prices for gold and silver continue to support the long term bear market thesis. This forecast assumes that the average inflation rate over the next 10 years will be between 2% to 2.25%, within the range being priced into the 10 year TIP. Last Wednesday, the government released a worst than expected revision to first quarter GDP. 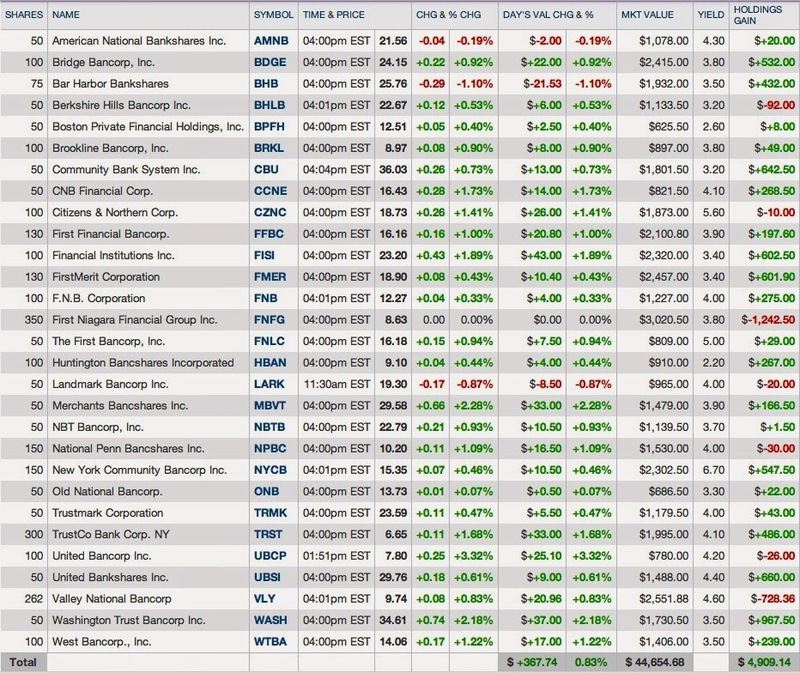 The stock market responded with the S & P 500 hitting a new all time closing high: S & P 500 1,920.03 +10.25 (+0.54%) And bonds went down in price and up in yield: TLT: $114.15 -0.61 (-0.53%). It is questionable whether a ten year treasury at its current yield will have a positive real rate of return. The average annual real rate of return based on the inflation forecast embodied in the 10 year TIP is minimal. It would not take much of an increase in that average inflation rate, which is almost 1% below the historical long term average, to cause a negative real return before taxes. The government revised first quarter real GDP to an annualized decrease of 1%. News Release: Gross Domestic Product The prior estimate was a .1% increase. The consensus estimate for the revision was a -.6%. The Case Shiller housing index for 20 large cities increased 12.4% in March Y-O-Y. Home Prices Rise in March Average home prices, however, are only back to mid-2004 levels (see chart at page 3). The PCE Price index for April increased by .2%. The Y-O-Y increase was 1.6%, up from 1.1% in March (page 3: Personal Income and Outlays April 2014.pdf) The FED prefers the PCE price index over the CPI. Various reasons are given for that preference. One reason which is not given is that the PCE price index has been running lower than CPI. The PCE price index has an over 20% weighting in medical costs compared to 7%+ in the CPI calculation. Federal Reserve Bank of Cleveland The PCE price index was reduced last year due to temporary government budget cuts to healthcare providers. Prior to those cuts, medical cost inflation was running at 3.1%, and was reduced to 1.9%. 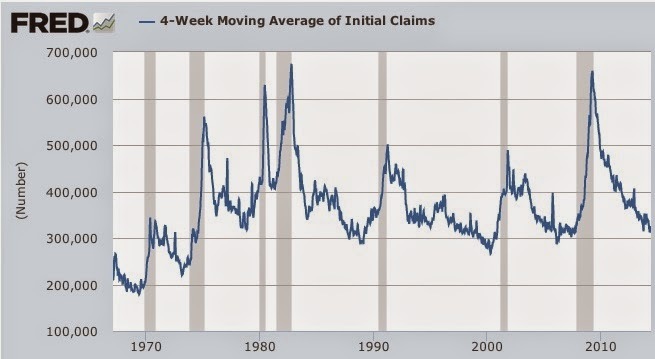 The historical long term rate of increase is about 5.5%. Medical cost inflation has started to pick up. 1. Bought 100 ARMF at $22.15 (see Disclaimer): I really wanted to wait for a lower price before buying more of this leveraged bond CEF. Since I have been selling some lower yielding securities, and consequently hurting my cash flow some, I decided to buy this high yielding bond CEF to replace some of that lost income generation. This lot was bought in a taxable account. I currently own 50 shares in the Roth IRA. I view this security as too risky for further adds in a retirement account. I have been substituting some higher yielding leveraged bond CEFs and some equity REITs for lower yielding equity preferred stocks and long dated bonds. The Canadian REITs have been a fertile area for yield over the past several months. I view this movement into leveraged bond CEFs to be temporary, lasting for a few weeks or months at the most. When there is another significant correction in equity preferred stocks that send their yields significantly higher, then I will start to transition back to some of those including the ones that I have been selling recently. Security Description: The Ares Multi-Strategy Credit Fund (ARMF) is a new leveraged income CEF that attempts to provide an "attractive level of total return" by "dynamically" investing in a broad range of credit instruments. Even a knowledgeable investor will not have any knowledge about most of the securities owned by this fund. Rationale and Risks: See Discussion in the preceding link. The fund has a summary of risks at its website, available for review after clicking the "Risk Considerations" tab. Ares Publicly Traded Credit Funds-Risk Considerations I regard this fund as high risk. This CEF pays monthly dividends at the current rate of $.1525 per share. At that rate, the dividend yield is about 8.26% at a total cost of $22.15 per share. Ares Multi-Strategy Credit Fund, Inc. Declares Monthly Distributions of $0.1525 Per Share; Distribution Tab at CEFConnect. Security Description: Western Asset Emerging Markets Income Fund (EMD) is a leveraged closed end fund that invests in emerging market sovereign and corporate debt. For 10 years through 5/23/14, the average annual total return was 10.07%. That number can be found by clicking the "performance" tab at CEFConnect. 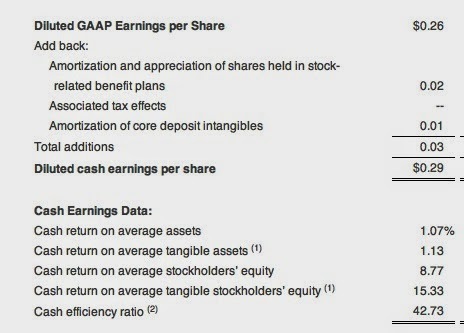 Rationale: The fund is currently paying a quarterly dividend of $.255 per share. Western Asset Emerging Markets Income Fund, Inc (EMD) Dividend History Assuming a continuation of that rate, the dividend yield would be about 7.97% at a total cost of $12.8. Income generation is the primary rationale for investing in this fund. Risks: Emerging market bonds are subject to a wide variety of significant risks which explains why I only nibble in this sector and will generally hold a position for a relatively brief period. This bond class fell significantly in 2013 as interest rates rose in the U.S. These EM bond funds have exposures to countries which I do not favor, such as Venezuela, and I would prefer that a fund simply avoid their debt altogether. 3. Paired Trade: Sold 200 Killam Properties at C$10.44 and Added 200 Healthlease Properties REIT at C$10.2 (Canadian Dollar (CAD) Strategy)(see Disclaimer): This pared trade was motivated by the Healthlease's significantly higher yield and better first quarter earnings report. 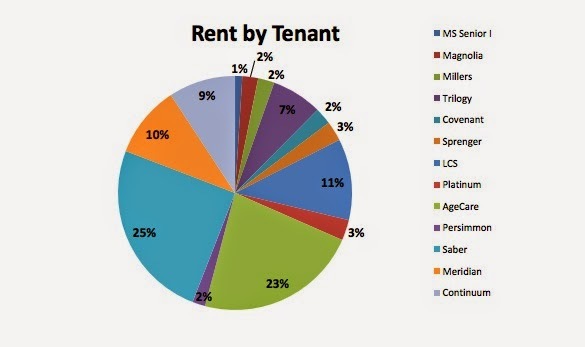 Healthlease Properties Real Estate Investment Trust (HLP.UN:TOR) is an externally managed REIT that owns senior housing and care facilities and is expanding rapidly in the U.S. The company recently completed the acquisition of 5 senior housing and care properties described in this news release: HealthLease Properties REIT Announces Completion of Acquisitions of Five Senior Housing and Care properties (5/21/14). Under triple net leases, the company has "minimal" operating expenses. 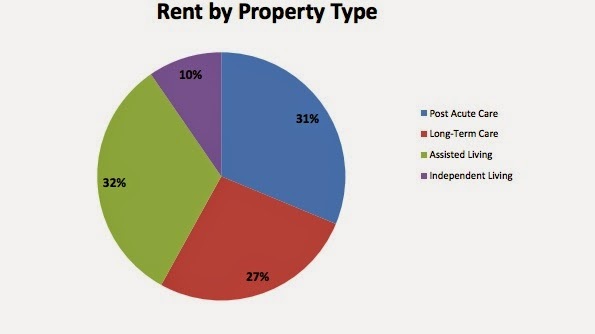 However, the REIT pays its external manager 3% of gross rent on each property and an incentive fee of 15% of AFFO per unit "above a certain threshold" established by the Board based on forecasted AFFO each year. (page 10). Rationale: I am picking almost 3% more in yield with the Healthlease shares, and Killam is not expected to grow FFO during 2014. HLP leases properties under long term triple net leases. This REIT is currently paying a monthly distribution of C$.07083 per unit or C$.85 annually. At that rate, the dividend yield at a total cost of C$10.2 is about 8.33%. HLP went ex dividend for its monthly distribution on 5/28/14, the same data as all of my monthly dividend paying Canadian REITs. Risks: I discuss risks in the preceding linked post. Among those risks, the company is externally managed and will purchase some properties developed by its manager after an "independent" appraisal. I always view external management agreements with disfavor. I would much prefer that a REIT be internally managed by its own employees. Healthlease is the only externally managed REIT that I currently own. Currency risk is always present when buying a foreign security. As with any REIT, the bankruptcy of a large tenant can have serious implications. Future Buys/Sells: I will be monitoring Killam for a potential re-entry at below C$9.75. The flat FFO guidance for 2014 is understandable but nonetheless undesirable. I will not be buying more of Healthlease. I hope to hold the 300 shares for a couple of years, harvest the monthly dividend payments, and hopefully make 5% to 10% on the shares. Security Description: The iShares Canadian Financial Monthly Income ETF (FIE:TOR) is a Canadian ETF. The other ETF holding is the Canadian Preferred Share Index Fund (CA:CPD) which has 205 holdings and a .45% expense ratio. 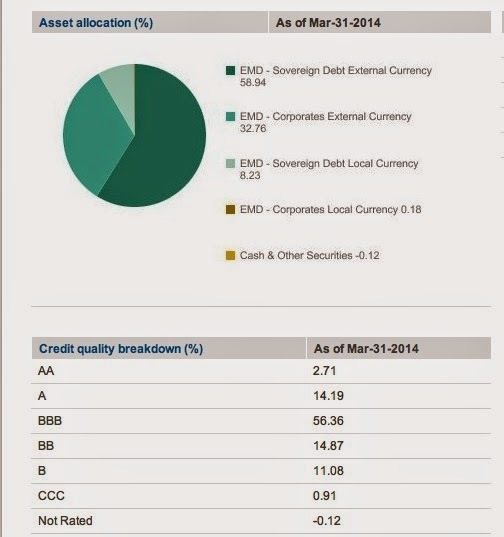 FIE will include acquired fund fees in its expense ratio. 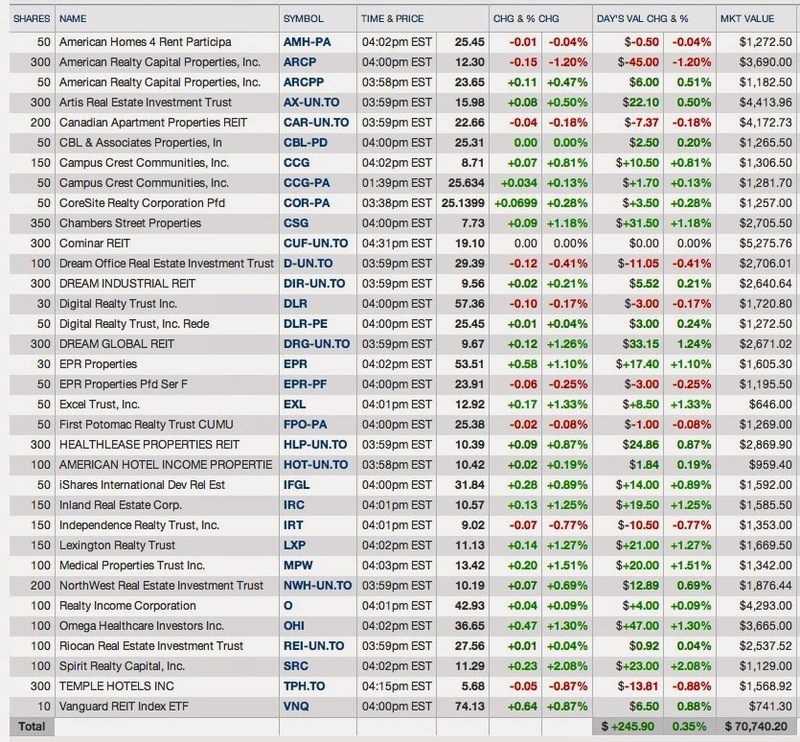 I do not own any of the top ten holdings other than the ETF CBO. I own individual positions in the REITs Cominar (300 Shares), Artis (300 shares) and Riocan (100 shares) which together accounted for 2.28% of the weighting as of 5/12/14. Rationale: My main purpose for buying this security is to generate income on my CAD stash. The dividend yield at a total cost of C$7.26 is good at 6.61%. Secondarily, I pick up more indirect exposure to Canadian banks and insurance companies. 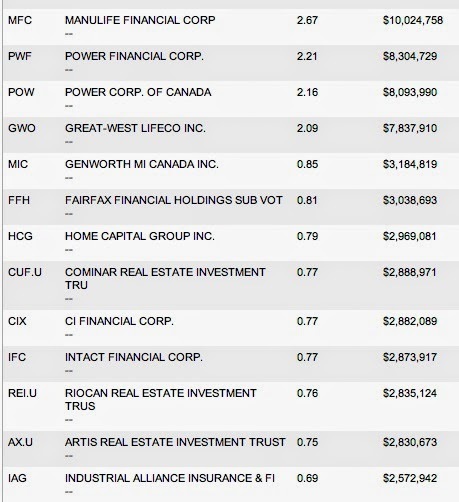 I have already some minor indirect exposure to a few of those companies in my 200 share position in the Canadian Dividend Aristocrats Fund (CA:CDZ) They have a higher weighting in the Canadian Select Dividend Index ETF (CA:XDV), which I also own. Risks: In addition to currency risk, there are the normal risks associated with a narrow sector ETF, particularly one that focuses on financial institutions. While the six large Canadian banks did far better than their U.S. counterparts during the Near Depression, their stock prices still suffered, and next time may be different. There is a concern expressed by some investors that the Canadian housing market is overheated or already in a bubble. (e.g. 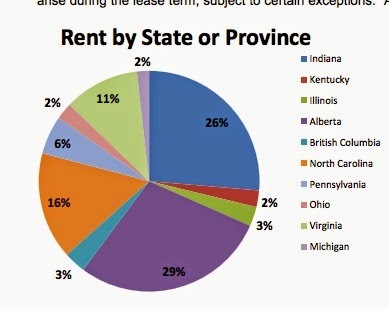 Morningstar article: "When the Canadian Housing Bubble Pops"). Future Buys/Sells: I am not likely to buy more. I will consider selling when and if I have an annualized total return greater than 10% or I become spooked about Canadian bank stocks. Security Description: Global X FTSE ASEAN 40 ETF (ASEA) tracks the 40 largest companies located in the ASEAN regions: Indonesia, Philippines, Singapore, Thailand and Malaysia. The three annualized three year total return is just 3.24% through 3/31/14 which just highlights how far emerging stock markets have fallen behind the U.S. stock market. Related Trades: I currently own small positions in iShares MSCI Singapore ETF (EWS), iShares MSCI Malaysia ETF (EWM), and a CEF that invests in Indonesia's stocks, Aberdeen Indonesia Fund (IF). I also own several diversified EM stock funds that would have some overlap with ASEA. I recently added to my position in IF and will discuss that trade in a subsequent post. Rationale: One reason is simply the underperformance of the ASEAN stock markets over the past three years. The long term trend is the parabolic increase in middle class consumers throughout this region. Many U.S. and European multinationals will benefit from that trend in addition to local companies. Deloitte Publication: "Business Trends 2014"
Forbes Article: "Why Your Business Needs To Break Into Emerging Markets"
Nielsen Publication: "Meet the New Indonesian Consumer Class of 2020"
Nikeii Asian Review Article: "Asia's expanding middle class"
This major long term secular trend is discussed in a large number of articles easily found on the internet. It is not a secret. The problem over the past few years is that this major trend has been masked and dampened by lower than normal growth in several developed countries over the past six years, including the U.S. and several European countries. Risks: This ETF has the usual set of risks for a foreign stock fund, including country risk. Recently, there has been turmoil in Thailand for example which has close to a 15% weighting in this ETF. Currency risk is very important when a fund owns stocks in emerging markets, as highlighted most recently by what happened starting last May when interest rates started to rise in the U.S. Emerging market currencies declined significantly and rapidly, which would then cause a decline in a fund priced in USDs that owns stocks whose prices are denominated in those depreciating currencies. When there is a spike down in EM currencies, there also tends to be capital flight by some owners of EM stocks and bonds, and that will contribute to the decline in the U.S. fund's value as the securities owned by it fall in value. Future Buys/Sells: I will most likely be using ASEA as a trade given its overlap with other existing positions. Security Description: The First Trust Morningstar Dividend Leaders Index Fund (FDL) is an ETF that attempts to track, before fees and expenses, the Morningstar Dividend Leaders Index. Rationale and Risks: This is a trade. I am simply attempting to earn more than zero which is what I was earning with the funds used to settle this trade. 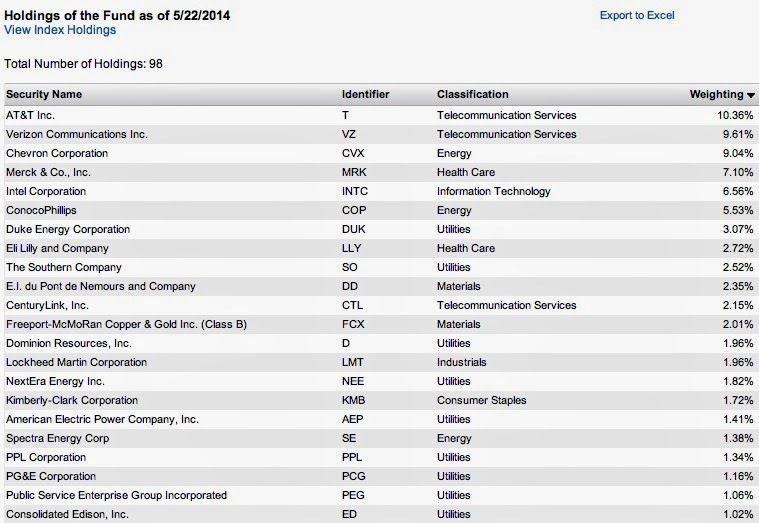 This ETF is weighted in large cap blue chip companies that pay good dividends. That will not stop this fund from going down in price during a correction in an ongoing long term secular bull market. 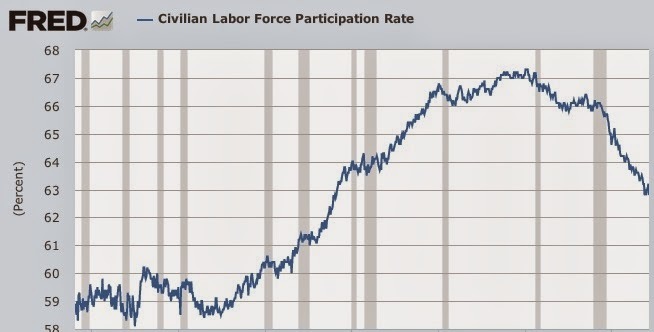 And, as shown in a long term chart, FDL was smashed during the Dark Period, hitting a high around $25 in May 2007 before doing the swan dive to $7.9 or so just before 3/9/12009. Chart First Trust Morningstar Dividend Leaders ETF The fund was hurt by a substantial weighting in financials that were "dividend leaders" before they crashed and burned. Bank of America and Citigroup are no longer "dividend leaders", and I will not live long enough to see their dividends restored to pre-2009 levels. Future Buys/Sells: I am using this security primarily as a trading vehicle and a short term depository for a cash allocation in taxable accounts that has grown beyond the normal 20%. Rationale: I am raising cash in my Roth IRA for later redeployment. I believe that the FED is ignoring current inflation trends in their ongoing effort to jump start the economy, hoping that inflation will not become problematic. Rationale: My current trading guidelines require that I consider selling a preferred stock when the price exceeds $25.75 and the yield is less than 7.25% based on the sale's price. This was the case with OFCPRL. The yield at a $26.21 price is about 7%. The trading guidelines represent an attempt to balance interest rate risk with current income generation. The markers are basically a judgment call that current inflation trends and the Fed's pedal to the metal abnormally accommodative and easy monetary policies tilt the balance toward selling when the marker is hit. Future Buys/Sells: I will want at least a 7.5% yield prior to considering a repurchase. Rationale: The yield fell below 7% based on the sales price of $23.81. At $23.81, the yield is about 6.96%. Future Buys/Sells: I may not buy this one back. I am becoming more concerned about REITs that own malls with JCP and Sears as major anchors. I have deleted once again the Google search box formerly located in the upper right hand corner. The search returns no results when a properly functioning search engine would return multiple hits. Instead, a search would simply return the entire last published post. For several weeks now, the Google box has been mostly worthless anyway. I could have a recent discussion of a new stock purchase, never before discussing that stock, where a competent search engine would return only one result. The Google search box would return results from 2009 or 2010 that would contain a tag from that recent post, but none of the information would actually be contained in those old posts. I have no idea how Google screws it up so bad. The search box in the upper left corner still works but returns an entire post with the relevant search term, making it less useful that a properly functioning google search box, which may be a bridge too far for Google. Since I already own Santander's common, I will probably just take the .7 SAN offer for each BSBR share. The offer is currently being evaluated. After I bought the BSBR shares, the company underwent a recapitalization and paid out two dividends totaling $.7807 per share. I was set up to reinvest the dividend, but Fidelity paid me in cash. Rocky Holdings will be a major component supplier for Apple and Samsung phones. Both RFMD and TriQuint recently reported better than expected earnings. 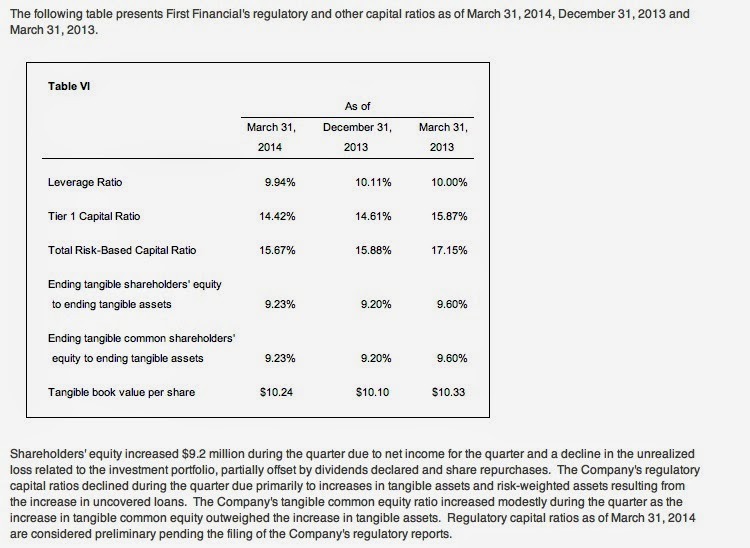 For its fiscal 4th quarter ending 3/29/14, RFMD reported non-GAAP E.P.S. of $.12 on $288.5M in revenues and forecasts non-GAAP E.P.S. of approximately $.17 in the current quarter. Any small technology company is automatically assigned to the LT category. There is nothing in my background that would allow me to make an intelligent assessment about the products and services offered by a company like Magic Software. There is nothing that I could say about this company that would be worth anything. There are some preferred stock eliminations that have not yet been discussed: CBLPRE and OFCPRL. 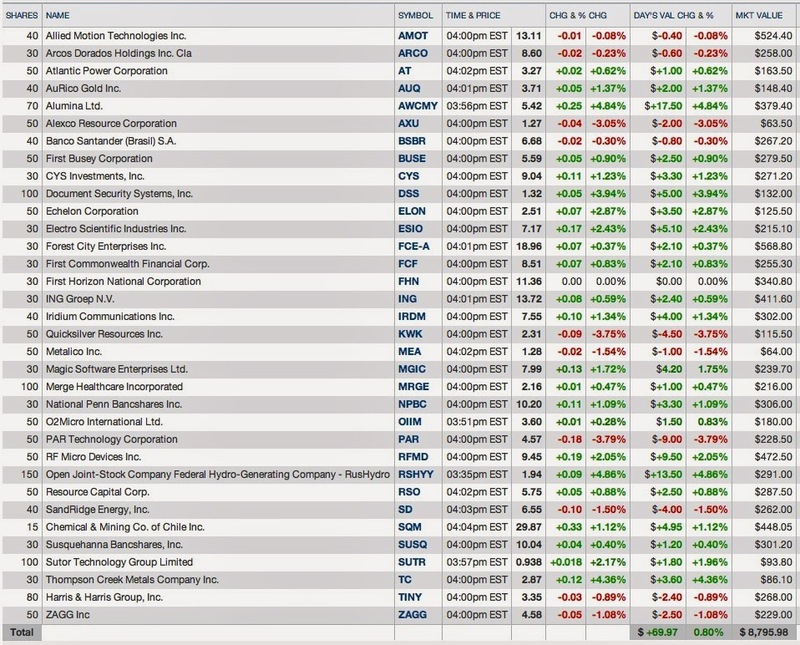 The table also reflects common stock additions and deletions that have not yet been discussed. I am picking up higher yields with the common shares. The ARCP common had a higher yield than its preferred at the prices noted above. 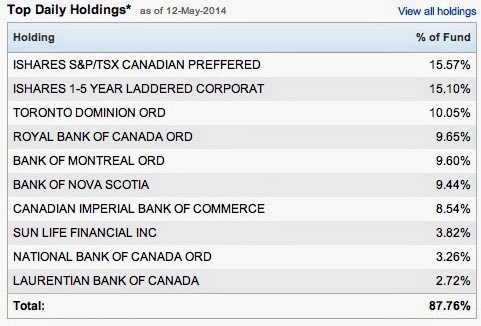 The Canadian REITs have over 8% yields. The equity preferred stocks were yielding less than 7% at the sales' prices noted above. I am near the lower end of that range after several small adds since my last update. For several small banks more dependent on mortgage originations, the uptick in rates last year hurt their mortgage origination business and caused Y-O-Y declines in earnings. The regional bank basket outperformed the regional bank ETF KRE last Friday. My basket was up .83% while KRE closed at 38.14 +0.18 (+0.47%). This year has been a tough one so far for regional banks. A. Berkshire Hills: Berkshire Hills Reports reported core earnings of $.42, up from $.40 in the year ago period. The consensus estimate was for $.4 per share. After selling 50 BHLB shares at $28.74 (+$338.12), I reinitiated a 50 share position at $24.51 last February. I am now in the red for those shares. B. Bridge Bancorp: Bridge Bancorp reported core E.P.S., which excludes acquisition related expenses of $.35 per share, up from $.32 in the year ago quarter. The consensus estimate was for $.28. C. NBT Bancorp: NBT Bancorp reported core net income of $18.4M for the 2014 first quarter or $.42 per share, up from $.39 in the 2013 first quarter. Subsequent to 3/31/14, NBT also noted that one of its wholly owned subsidiaries sold its 20% ownership interest in Springstone Financial, acquired for $3M. to LendingClub who acquired all of Springstone's outstanding equity for $140M in cash and preferred stock, or $28M for a 1/5th ownership interest. D. First Financial: First Financial Bancorp reported first quarter net income of $15.1M or $.26 per share, up from $.24 in the year ago quarter. Loans, excluding "covered loans", rose 12.6% on an annualized basis. Covered loans are subject to a loss sharing agreement with the FDIC. FFBC acquired two failed banks in 2009 through FDIC assisted transactions. (page 2 2013 Form 10-K) FFBC currently has 106 banking centers in Ohio, Indiana and Kentucky. After profitably selling my highest cost shares, I currently own 137+ shares at an average cost of $14.84. Item # 4 Sold 57 FFBC at $17.03-Highest Cost Shares The current dividend yield based on that total cost number is 4.04%. E. United Bankshares: United Bankshares reported first quarter net income of $30.1M or $.48 per share up from $.43 in the 2013 first quarter. F. New York Community: New York Community Bancorp reported cash earnings of $.29 per share and GAAP earnings of $.26 per share. The current quarterly dividend is $.25 per share. New York Community Bancorp, Inc. (NYCB) Dividend History Given the payout ratio, a dividend cut is certainly a possibility. Old National Bancorp (ONB) is the largest financial services company headquartered in Indiana and is among the top 100 banking companies in the U.S. I have previously bought and sold Old National Bancorp twice as part of the regional bank basket. My only observation about the foregoing history is that my last purchase was at least below my last sale's price. I decided to repurchase shares after reading the 2014 first quarter earnings report. ONB reported net income of $26.5M or $.26 per share, up from $.24 in the 2013 first quarter. The Board declared the regular $.11 per share quarterly dividend. At that quarterly rate, the dividend yield at a total cost of $13.29 is about 3.31%. As of 12/31/13, ONB had 169 "branches and financial centers".